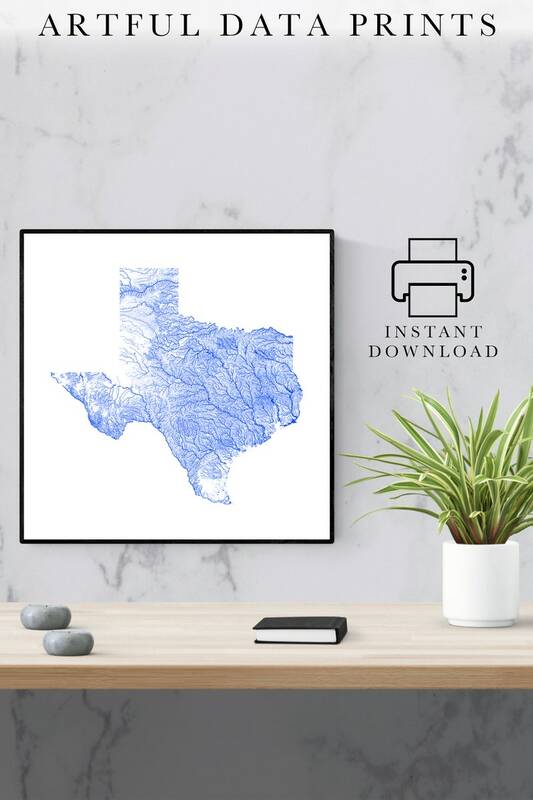 This listing is a digital download of the rivers and waterbodies of Texas, printable in a number of picture frame sizes from small to very large. Welcome to Artful Data! I love exploring the beauty of the information around us every day, and I pride myself on capturing that beauty in the form of unique wall art for your home. My Texas map is created from public watershed datasets and shows the thousands of rivers and waterbodies of the state in incredible detail. These images are extremely high resolution, so they look great up close and far away. They make great gifts for lovers of maps, anybody with a special place in their heart for Texas, and anyone who enjoys unique wall art! You can print my digital downloads at home, load them on a flash drive to take to your local print shop, or upload them to an online printer such as Staples or FinerWorks and have them delivered to your door! Digital downloads are a great option when you need your print fast or when you prefer to get crafty and do it yourself! After you checkout, you will receive an email that your payment has processed and it will include a link to your download. Additionally, you can access your files within Etsy by viewing your Etsy profile and clicking your purchases and reviews section. This image contains royal blue rivers on a white background. I'm happy to create a customized artwork in the color of your choice for an additional customization fee - please send me a message if you are interested in a different color! This listing is for a digital download. No physical product will be shipped and the frame is not included. Color may vary slightly due to differences in computer monitors. This purchase is for PERSONAL USE ONLY, commercial use is prohibited.